What is wrong with this picture? 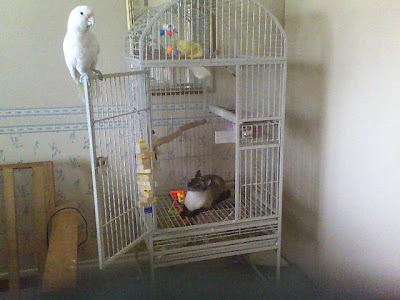 This is my sisters parrot and cat. 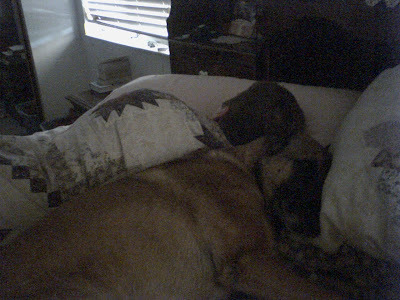 Quixa sleeping w/ Daddy... she can't wait for Matthew to get up so she can snuggle up to Mike. This is an every morning thing. 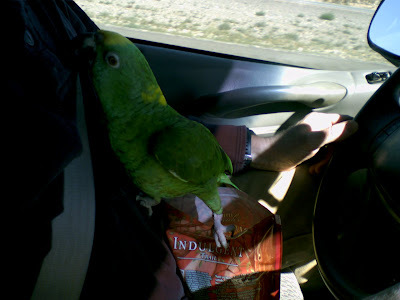 This is our little green girl, Aimie.... struggling to get herself an almond while driving to Beaver. She will risk life and limb to get at an almond!!!!!!!!!! 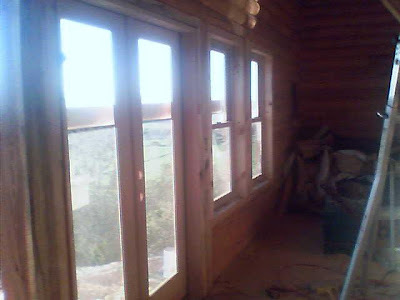 Timmy finished up the family room windows. Mikey getting ready to stain. View of the entry way and mudroom from the family room. 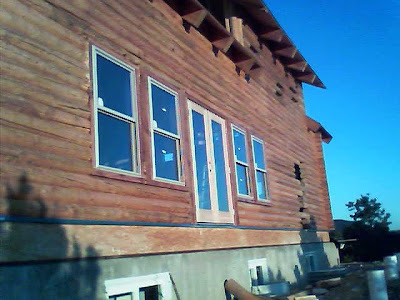 The back french doors and two of the four 3x5 double hung windows. Tim taking a little phone break. He's getting the posts up in preparation for the winders. 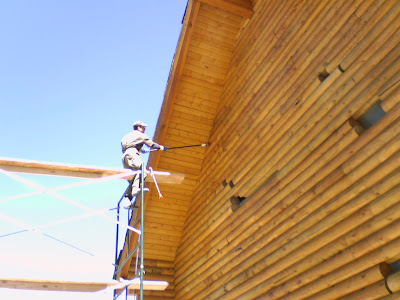 Mike staining the side. It takes one whole day to do each side. 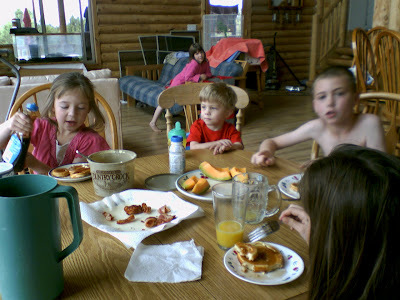 A breakfast w/ the kiddies.... still trying to entice Magoo to eat food!! We had Mickey Mouse waffles. Of course, Matthew didn't want anything. The back side all stained... you can see the other side is not done yet. So, what do ya think? 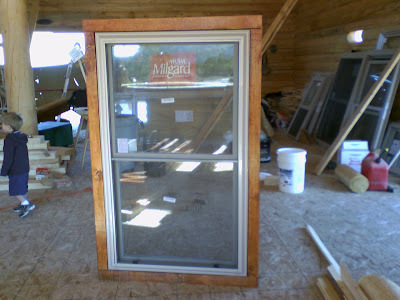 We used Natural Cedar stain. 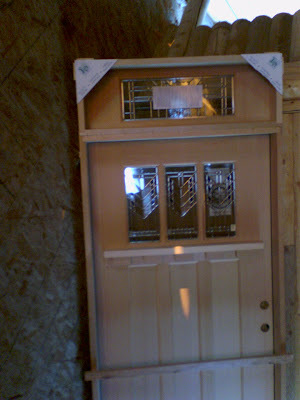 This is our very expensive front door w/ transom and a dentil shelf under the window. 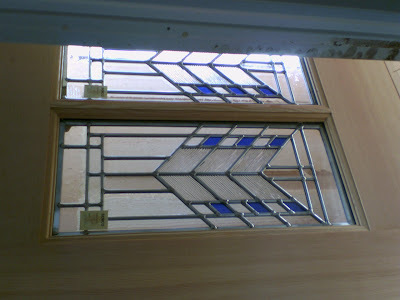 This is the balcony door and other doors. 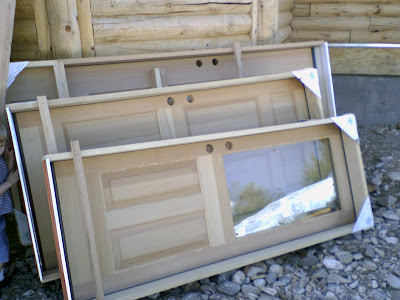 I helped Timmy with the window buckings. I also helped to stain. Finally, I get to help out! Mikey getting ready to go train the forces at the firing range. Looking into the mudroom from the entry way. I must say that Tim sure had his work cut out for him. This entry way/mudroom was very very complicated. There was a lot going on and he had to spend so much time making sure it could all work out. 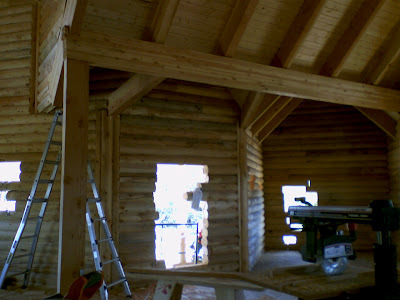 He then had to be sure to somehow to connect it properly to the octagonal kitchen area ..... trust me ... he spent hours trying to figure it all out in his head before he started making cuts and setting beams/tung and groove. The stairwell be on the right side of the mudroom. 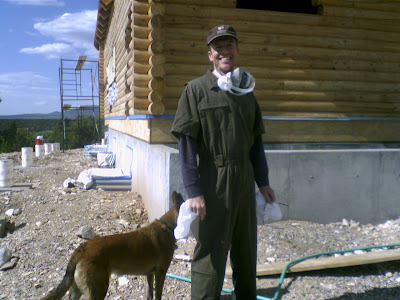 We thank God everyday that we have Tim to build our dream home. Looking up at the entry way (to the left) and the mudroom (to the right) ~ where it connects. Standing in dining room, looking towards the kitchen/entry way area and the mudroom is all the way down to the left. Someeeeeeday there will be a 2 or 3 car garage w/ an "in law's" quarter hooked right up to that mudroom. That will look sooo totally awesome. We can't wait for that. Then mom and dad can come stay in their own little corner. Tim working on the entry way. He's been killing himself w/ work. 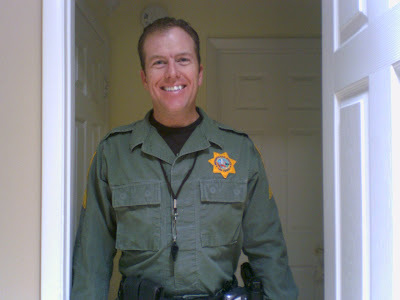 Not only does he work on this cabin but he has another full time job. The porch is going to look so cool. Mike will have rounded stairs going up to the deck. View from front kitchen window. The kitchen window is an 8 foot by 3 foot picture window. View from our dining room. There will be french doors here that open out. 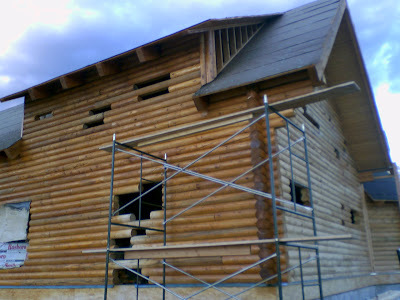 Mike is planning to start staining the logs on the outside. 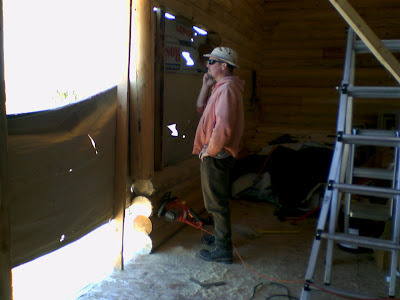 In the next two weeks, Timmy is going to work on the window buckings and start putting in the windows. and Mike isn't up there but 3 to 4 days a week. Besides, we're really not in a rush... as long as we get our water rights extended!! Won't be too long before the roof goes on. 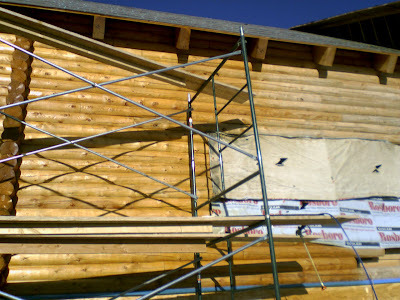 Once the entire house is stained, the roof will go up. Apparently it will take MONTHS caulking the outside and inside. Not too sure when we'll be able to start the decking ... the concrete guy still needs to come and move those 12 footers around the house. They did not pass code back in November (they need to be buried 31 inches) and we are having some trouble getting him up there to fix his mistake. THAT IS A WHOLE NUTHER STORY! !